In this edition we're showcasing 3D models by Filtrine Manufacturing Company, Garden Arc, Hearth Products Canada, & Innoplast. We've also gathered projects from K2 Stone, Paris Site Furnishings & Outdoor Fitness, Chutes, & RMAX. 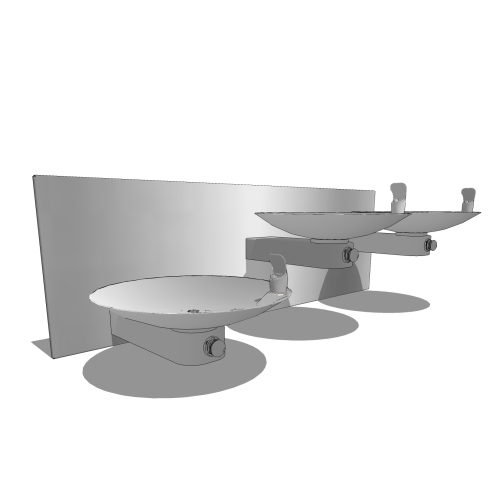 The Model 107-14-HHL is a wall-mounted triple bowl drinking water fountain. The 14” diameter 16 ga. round bowls each have an integral drain. Overall fountain height is 3-1/4”. The hand-polished bronze finish comes in either #4 Satin (standard), or in #8 Mirror or Oil-Rubbed or Statuary Bronze. The hand-polished stainless steel drinking fountain and cover plate can be finished in your choice of either #4 Satin (standard), or #8 Mirror. The copper/brass waterways are 100% lead-free—NO PLASTIC TUBING/CONNECTORS ARE USED. The Bryant is an elegant surround that transcends all design styles with multiple layers of intricate yet linear carvings. The base blocks further enhance its stature and solid stance. The Mesa copper fire bowl is deep enough to allow for the control box of the remote electronic ignition inserts to be inside the bowl as well as the match lit ignition system valve. This gives the flexibility for placing the fire bowl at ground level. Located on the shores of Sylvan Lake Alberta, this prairie estate home showcases a contemporary craftsmen design. Autumn Flame Ledge Stone is featured on both the interior and exterior of the home. The outside walls are wrapped in natural stone veneer and Hardie Plank siding, highlighted with unique timber frame accents. On the inside, there are three unique fireplaces each of which have incorporated wood or stone hearths and mantels. Paris Equipment Manufacturing Limited is committed to "Creating Lasting Impressions" within your parks and green spaces. We know that community parks are more than just green spaces. They are about memories. They are about community barbecues and picnics. They are about safe healthy gathering spaces for families in your community. From benches, such as the Premier, through to picnic tables, litter receptacles and bike racks, Paris Equipment Manufacturing Limited has been built on providing safe, durable furnishings and amenities to make any park memorable. The Anaheim Convention Center is the largest convention center on the west coast, hosting 190 conventions a year and attracting more than 1 million guests. The $190 million, 450,000 sq.ft. expansion will add 200,000 sq.ft. of flexible space, 10,000 sq.ft. of balcony space, 100,000 sq.ft. of column free space and 1350 parking spaces. The expansion will also include a pedestrian bridge concourse that will connect the parking structure to existing Convention Center facilities.